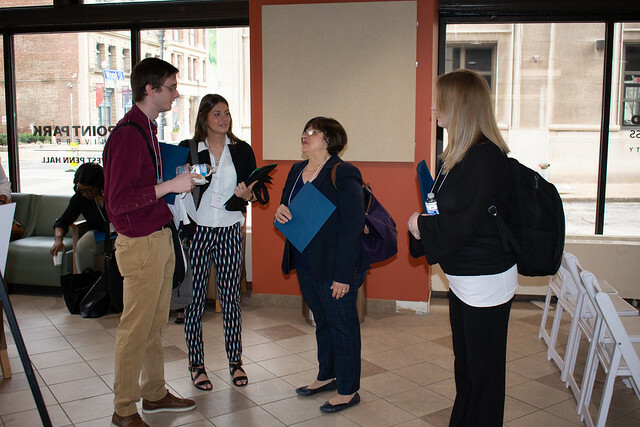 With more than 80 graduate students, faculty and staff in attendance, Point Park University’s inaugural Graduate Student Conference April 14 exceeded expectations — reaching capacity three weeks before the event. The conference opened with a welcome from Assistant Provost Jonas Prida, Ph.D., followed by graduate student research posters and presentations on various topics from global economic inequality and community violence to social innovation and solar farm planning. Participating in the conference were graduate students from a wide variety of disciplines including those pursuing master’s or doctoral degrees in business administration, community engagement, education, engineering management, environmental sciences, health care management, leadership and administration and psychology. Alumnus Billy Hartung '93 '08, executive director of The Center for Theater Arts, served as the keynote speaker. Hartung has written curriculum and taught acting and musical theater for the performing arts faculties of The Pittsburgh High School for the Creative and Performing Arts, the Carnegie Mellon University Pre-College Program and the Pennsylvania Governor’s School for the Arts. In addition to presenters, all of the graduate students in the 21st Century Schools class taught by Vincenne Revilla-Beltran, Ph.D., attended the conference. “Attending the conference helped me in a number of ways. I plan on teaching in the near future and a lot of the research presented dealt with issues in the education field. It also showed me what pursuing a doctoral degree would entail,” said Casey Stevens, a M.Ed. secondary education student who graduated from Derry Area High School in Derry, Pa. Faculty members Archish Maharaja, Ed.D. ; Brent Robbins, Ph.D.; Yaser Roshan, Ph.D.; and Sarah Schulz, Ph.D., organized the conference along with several student volunteers. “It was a real pleasure working with Drs. Maharaja, Roshan and Schulz to realize this first Graduate Student Conference in the history of the University,” Robbins said.